Reviews of Christmas gift books coming to the blog in 2015! Lunch Lady is passionate about her job, wanting the school children to get proper nutrition from her lunches, as well as learn about what they’re eating. Because of this dedication, it’s no surprise that she’s also an undercover superhero, protecting the school from evil! She has a variety of food-related gear and weapons at her disposal, like Sonic Boom Juice Boxes, Hover Pizzas, and Taco-vision Night Goggles. When the librarians steal other departments’ funds and plot to take over the world, the Breakfast Bunch seek out Lunch Lady for help. Will they be able to keep the librarians from destroying all the video games? Lunch Lady is the main character, but it’s hard to really identify with her. Then again, she is a superhero, and it’s hard to ever really know the truth about superheroes. Betty is her sidekick, both in the lunchroom and when fighting evil. Dee, Hector, and Terrence are the students who know Lunch Lady is a superhero, and they make up the Breakfast Bunch. The kids are fun and realistically portrayed, and I think young readers could easily see themselves in these characters. The Breakfast Bunch has a feeling the librarians are up to something, so they tip off Lunch Lady, who starts investigating on her own. The librarians have been stealing money from the school’s other departments, like the cheerleaders, and want to destroy all video games so children will have to read books. 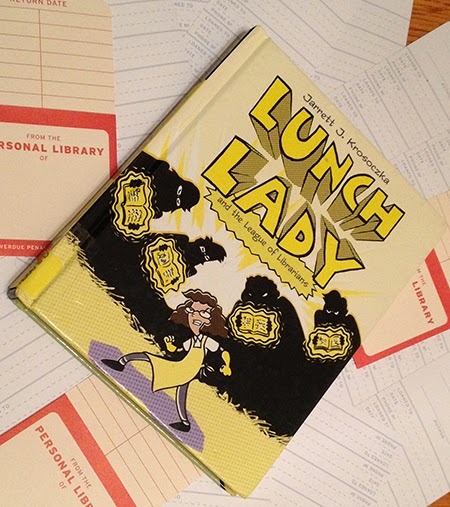 Can the Lunch Lady and her lunch-related gadgets beat the librarians and their book weapons? Most of the book takes place in the school, which will draw in readers because they can identify with the setting, and picture the events occurring in their own school. Lunch Lady’s turf is, of course, the lunchroom, and the Read-a-thon takes place in the library. The showdown between Lunch Lady and the librarians takes place on the docks, where the video game shipment is delivered. The illustrations really bring the settings to life, without being so detailed that readers can’t use their own imaginations. Since Lunch Lady is a superhero and the problems she faces are a bit fantastical, it’s hard to pinpoint a theme in these graphic novels. Lunch Lady is fighting for what is right for the school and the students, but she does so by using weapons - clever, lunch-themed weapons, sure, but weapons nonetheless - and violence. Graphic novels have more illustrations than typical illustrated novels, and the pictures actually help move the story along. I think young readers, whether they enjoy reading or not, would like picking up extra elements to the story that are somewhat hidden in the illustrations. Krosoczka uses black and white drawings with minimal shading and color - only yellow inside the book, and yellow, green, and purple on the cover. I think the lack of color and matte pages make this book stand out over more traditional comic books. It looks more like a novel, which probably makes kids feel more accomplished reading it than they do with flimsier comic books. I have read Lunch Lady books #2 and #5. They seem to be very popular in our library system, because I haven’t been able to get my hands on book one! Luckily, the early books seem easy to pick up and read without the overall context of the series, though I’ve seen that they get more involved as the series progresses. I intended to start from the beginning and read them all, because they’re quick, amusing reads. In all fairness, I have to say this wasn’t my favorite Lunch Lady book, just because I’m biased - I prefer print books! I’m not saying that people shouldn’t play video games, but I was more on the side of the “evil” librarians than Lunch Lady in this case! Booklist gives the series a rave review, saying “This tongue-in-cheek superheroine graphic novel will hit the spot for chapter-book readers. […] Little details invite and reward repeat readings with visual as well as verbal punning.” The books have been “Inspired Recommendations for Kids from Indie Booksellers” by Kid’s Indie Next List, a “Cooperative Children’s Book Center” choice, and repeatedly nominated for the New York State Charlotte Award. Underage cab driver Ed Kennedy accidentally foils a bank robbery, thinks nothing of it, then is surprised to be chosen as some sort of messenger. Playing cards are delivered to the shack where he lives with his dog, the Doorman. Ed has to decipher the meaning of each card, then complete the task associated with each of the names or addresses on the card. Nothing is explained to him - he has to decipher the purpose of each task on his own. He knows he has to complete everything before a bigger truth is revealed to him, but he can’t stop wondering who put him up to this, and why they picked him. Ed Kennedy is a perfect character, because he is so imperfect. He lied about his age to get a job as a cab driver after his dad died from alcohol abuse. He lives in a shack - and drinks coffee- with his dog, the Doorman. He regularly plays cards with three friends, one of whom he’s in love with. His life seems to have no purpose, and this doesn’t really bother him until he realizes there’s more out there. The messages he interprets show him that he is a good person, and deserves to live a good life. He is easy to identify with regardless of the reader’s age, but I think young adults will really take a shining to him. His friends are also complex, interesting characters with great backstories the reader learns right along with Ed. The book opens on a bank robbery; Ed and his friends are inside, on the floor, watching the incompetent thief trying to get his hands on the money. Ed foils the robbery, somewhat accidentally, and just as incompetently. He is, however, lauded as a hero in his hometown, and enjoys a bit of fame as a result. Once the attention dies down, he returns to his job as a cab driver and wonders what is the point of his life. When playing cards are delivered to his shack with brief instructions, Ed finds himself delivering messages he learns on his own. It seems to be an unlikely plot, but after Ed’s name being all over the news due to the robbery, it’s not hard to believe that someone would pick him to do good all over town. Ed realistically struggles to decipher each message, and learns something from each, while still suffering through his own problems. Ed and his friends live in a small town in Australia. It’s easy to picture the small town, especially if you’re hearing Marc Aden Gray’s Australian accent in the audiobook! The description is shown by Ed being able to walk from his shack to his job, as well as many other places in town, but needing to drive to a few places that seem to be out in the country. This setting is perfect for the story, because it’s believable that people in a small town would hail Ed a hero for stopping a thief, but Ed himself wouldn’t know everyone he was delivering messages to. When we first meet Ed, he is wasting time by living his life passively. He works as a cab driver, a job he only got because he lied about his age. He lives in a shack with a smelly dog, and spends most of his time with the same three friends - one of whom he’s in love with, but never makes a move. Ed’s transformation is slow, which makes it realistic. He learns life lessons with each message he delivers, and he looks at his own life differently and tries to figure out what he wants. There is no sudden epiphany, and the ending is left open for him to grow even more. I think this approach is best because there is no heavy-handed moral or lesson that will make young adult readers feel preached to, but they can relate to Ed’s gradual change of heart. Zusak’s writing style is casual and conversational, which fits the story and theme perfectly. There is some Australian slang thrown in, which is one of the main reasons I’d suggest listening to the audiobook. Hearing the dialect spoken aloud helps the book read smoother, and helps the reader understand the slang with context clues. Ed’s dog “talking” to him seemed a little far-fetched for this book, because that’s the only magical or fantastical element, but it didn’t ruin the story. I listened to this as an audiobook and absolutely loved it! Marc Aden Gray, with his Australian accent, was the perfect narrator since the characters are Australian. He seemed to have fun with the narration, changing his tone according to the story, and even changing his voice for different characters. This really helped pull me into the story. Most audiobooks I’d tried to listen to previously were read more straight-forward, so my mind wandered instead of paying attention to the story. 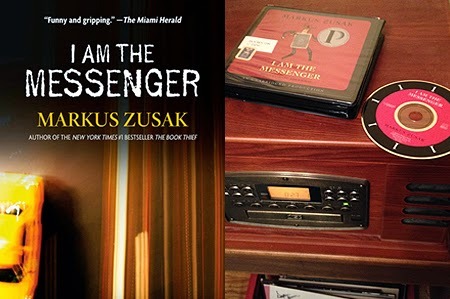 I Am the Messenger made me think of radio shows from the time before TV, when families would gather ‘round to listen to a story, instead of turn on the TV and expect to be entertained. The audiobook was well-done, but I would have loved this story regardless of how I read it. There was a bit of suspense and mystery throughout the whole story, and I really identified with Ed. The ending, however, has to be one of my favorite book endings ever. I kep thinking about it - and that’s all I’ll say! Read it for yourself and you’ll understand why it might have ruined me for all other books! The ideal audience for this book is high school and up. Since these readers have major life changes around the bend, push this activity outside of the library or classroom. Have readers think about the messages Ed delivered - the safe ones! Most were good deeds. What good deeds could students do to change the course of their own life, or at least broaden their worldview? Deliver meals to the homebound? 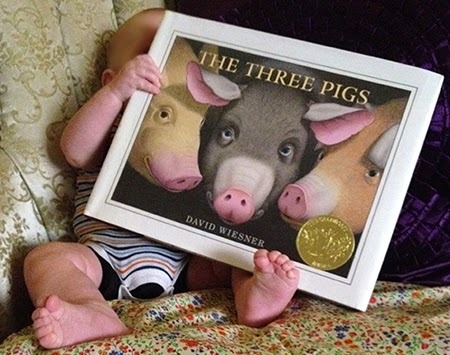 Read books to preschool children? Visit senior citizens at the retirement home? Volunteer at a soup kitchen? The possibilities are endless! Zusak, Markus. 2006. I Am the Messenger. Narrated by Marc Aden Gray. New York: Random House Inc. Listening Library. Audiobook. 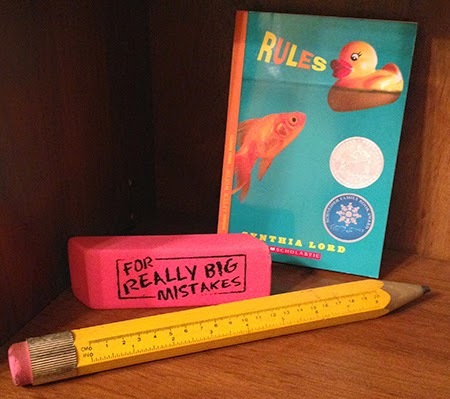 In this semi-autobiographical, historical novel, Jack Gantos invites the reader to get into mischief all summer long… except there’s a hitch: Jack gets “grounded for life” by his mother! When an elderly neighbor needs his help typing obituaries, Jack’s mother releases him from his room to do a good deed. This good deed is more fun than Jack expected it to be, and he spends the summer learning to drive a car instead of a tractor, learn local history, and investigate deaths that make his nose bleed uncontrollably! Jack Gantos is a fantastic narrator - both as a character in the story, and for the audiobook! His audible and written voice brings the past to life, inviting us to explore small town life in the summer of 1962. 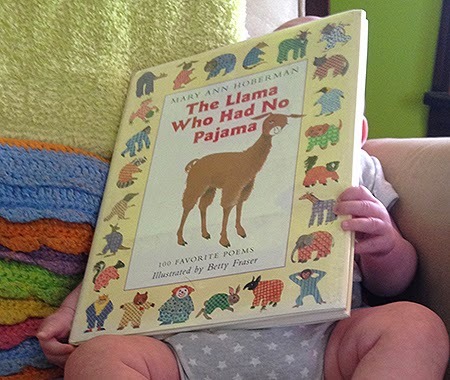 He gets into a lot of trouble because he loves reading - and reenacting! - history, instead of focusing on the present. This book is a fun mix of crazy fictional adventures and genuine history. It will probably be hard for children to tell what is true and what isn’t, because it was hard for me! But it is a fun, engaging story, and you learn history without realizing it. Gantos gives just enough information to draw the reader in, but stops short of making it seem like a history lesson. Since it’s such an easy, light-hearted book (despite all the blood! ), readers will more than likely be curious enough about the history mentioned to research on their own! There’s something about a small town that seems timeless, and Norvelt, Pennsylvania is a small town. It’s great to hear how young Jack goes from driving a tractor, to driving a car, to decently driving a car in such a short span - only in a small town! Learning about how Norvelt was founded, and what values it was founded on, helps readers better envision the town, the citizens that inhabit it, and the era when all of this occurred. A boy getting in enough trouble to be “grounded for life” is the most timeless theme I can think of! Jack’s curiosity about history and the world around around him will certainly inspire contemporary readers to explore their own lives for story, and will more than likely inspire some historical research along the way. This is a fun read, and it only helped things seem more cheerful (even with all the death!) to have the author reading it himself. The story was told the way you would share life stories with friends and family, and hearing the author use timely slang like “cheese-us-crust” only makes the audiobook experience more enjoyable. 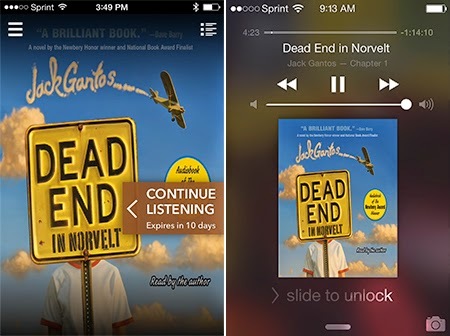 I can sit and read for hours without moving, but I have a tough time focusing on audiobooks. Some of the tangents Jack goes off on in the book lost me in the audio format. It seemed like at least once a chapter he would go into great detail about a history book he was reading, or flashback to a previous event. These scenes might have only been a paragraph or two in the physical book, but in the audio book, they were a section where my mind would run off in its own direction. Overall, I feel like the story stuck with me more hearing the author tell it in his own voice, because I could hear the enthusiasm and playfulness of his true self come through in his characters. Jack Gantos doesn’t let his Norvelt adventures end here! Students can read more in From Norvelt to Nowhere, ISBN 9780374379940. Note: this audiobook is also narrated by the author! I highly recommend listening to Gantos tell his story. Gantos, Jack. 2011. Dead End in Norvelt. Narrated by the author. New York: Farrar, Straus and Giroux. Audiobook. Tarantulas are misunderstood, billed as the scariest, deadliest spider known to man. In reality, their bites have never killed a man, and they would rather hide than harm a human. In this book, Sy Montgomery follows Sam Marshall, an arachnologist who studies wherever the tarantulas call him. The book explains the parts of tarantulas, how they got their name, spiders who are confused as tarantulas, and more. Sy Montgomery follows Marshall as he stalks tarantulas in South America, then studies them in his lab in Hiram, Ohio. The book is clearly well-researched, since Sy Montgomery conducted much of her research right alongside Sam Marshall. 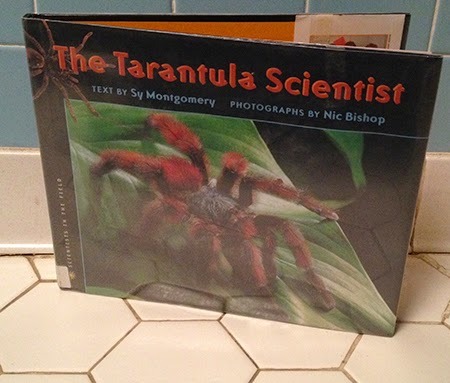 The book ends with a lot of information about handling (or not…) tarantulas, spider statistics, and a breakdown of terms used throughout the book. There is also a section about how the book was researched, giving details about the author and photographer and how they compiled the book. There is also a bibliography, as well as websites to further research tarantulas. Montgomery has the perfect approach to this book: he writes to the reader as if they already know everything, yet explains things in ways that build them up to actually know everything. Difficult words are spelled out phonetically in parenthesis, and a lot of terms and methods are explained, but not in a way that makes readers feel dumb. Chapters are creatively titled, but not listed in a table of contents. It is hard to speak to the book’s attractiveness, since I personally am creeped out by tarantulas despite learning that they are not harmful to humans. Trying to be diplomatic, I must say that Nic Bishop’s photographs are amazing. There are extreme close-ups, showing the true beauty of tarantulas. The photographs aren’t limited to tarantulas, also showing wasp nests and Marshall at work in his lab. There are photos on every page, even if it’s a text-heavy page with just a few tarantulas “crawling” up the margins. This book was a little more cut-and-dried than the others I read for the informational genre, but that didn’t make it hard to read. It gave a lot of great information about tarantulas, as well as gorgeous (I have to admit!) photographs. The author didn’t seem especially passionate about the subject, but I think in this case, it worked to have some distance from the author and the subject. I think an author who loved tarantulas too much might have made the subject harder to handle, but the book was written as a perfect mix of knowledge and passion. I have to admit that I’m not a big fan of spiders, especially tarantulas, but this book completely drew me in. The photographs, I could have done without. I shuddered every time I looked at them! But the knowledge I accrued from reading this book was amazing! Tarantulas are something I never would have looked into on my own - I think they’re too creepy, but honestly, most of the knowledge I had about them was false! I loved learning that they didn’t harm humans, and that they had teeth as well as fangs, and more. I think that reading children’s nonfiction will actually be the way I approach learning new things that I don’t really want to learn about! In 1869, workers digging a well on William Newell’s farm were astonished when their shovels hit something hard. After a few hours, they excavated a massive stone man, who scientists and assorted “experts” deemed as a petrified man. Newell let other men buy shares in ownership of the giant and they toured the giant around the country. P.T. Barnum thought the man was a fake, and “found” his own to tour. There was a competition between the two giants, until scientists and other experts studied both giants and came to a conclusion regarding their authenticity. 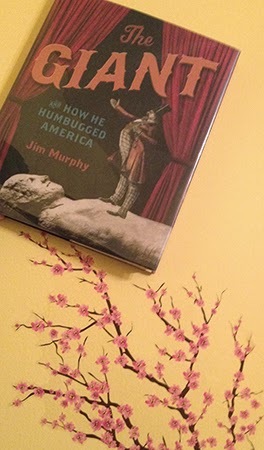 Jim Murphy’s bio states that he carefully researches his nonfiction and has won awards such as two Newbery Honors, a Sibert Medal, and the Margaret A. Edwards Lifetime Achievement Award. I feel like these accomplishments give him credentials worthy of the book he’s written. The book does not have in-text citations, but the last few pages of the book are Source Notes, divided by chapter, that give extra details on things mentioned in the text. Since information is not given as parenthetical documentation or footnotes, I feel like this is the best way to appeal to children, and I feel like they would read the entire book, including the source notes. The book is told chronologically, from the time the giant was discovered until he was retired in a museum. There are a few flashbacks to explain how the giant was created and planted, and the book ends by focusing on a modern day hoax that National Geographic fell for. The book starts with a cast of characters and what parts they played. Chapters are titled according to the major action that occurs during the text. After the conclusion of the giant’s story, there are brief summaries of other famous hoaxes. Source notes are included, as well as a bibliography, photo credits, and an index. There is also a detailed section about the author’s research process. This book is fairly text-heavy, but the font is larger and more spaced out than typical 12 point, single-spaced formats. This makes it easier to read - even on the pages where there are no photographs or illustrations. All of the artwork included in this book is historical; it’s not illustrated like an informational storybook. The photographs have dates and credits, the illustrations are most frequently political comments from newspapers of the time, and scans of relevant promotional booklets and posters are included. Though even the artwork is informational, the book does not seem boring or a heavy-handed history book. The book is written fairly formally, but it does not make it hard to read. Because the subject is so interesting, it’s hard to feel like you’re learning something as you read this book. In “A Word About My Research,” Jim Murphy explains that he became interested in the topic because he wanted to learn about Bernie Madoff and his Ponzi scheme. I think this is a great way to engage readers because he portrays himself as a regular guy, curious about the things around him. I think children can relate to this, and might even suggest reading this section before starting the book, as interesting as the hoax topic is on its own. I’m big on conspiracy theories, and I love the idea of hoaxes and how they have been pulled off. I had never heard of the Cardiff Giant, so this book not only taught me a lot about that particular subject, but also gave me a great idea of how America was during this time. Despite being intrigued by the subject matter, I was also really drawn in to Murphy’s writing style, and look forward to reading more of his work. Jim Murphy mentions many other hoaxes at the end of his book; any number of these would inspire students to research on their own. It would also be interesting to open a conversation with children about what they consider a hoax, since there are many modern conspiracy theories that aren’t addressed in this book. Fun fact: My son has the same name as Alice’s father! Alice Roosevelt was unlike the other girls of her time. She called the way she lived life “eating up the world” - but her father, Theodore Roosevelt, said she was “running riot.” Alice’s mother died when she was just two days old, and her father remarried and had more children. Alice never really fit in with the family, preferring to join an all-boys club and race her bike around town. Instead of attending boarding school, she convinces her father to let her learn from his personal library. After Roosevelt is elected president, Alice travels extensively as her father’s goodwill ambassador, taking the world by storm. 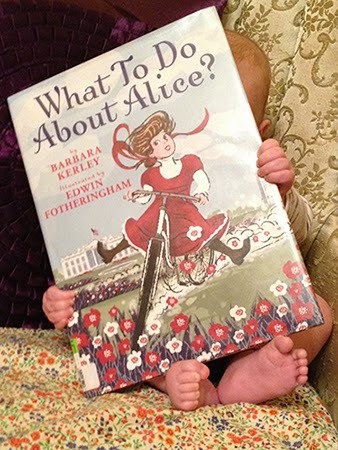 In her bio, author Barbara Kerley mentions how and why she became familiar with Alice Roosevelt. This leads one to believe that the book was a labor of love, researched because the author was enthralled with her subject. Kerley has written other picture book biographies. The book ends with an author’s note, giving information about why her father’s second family might have prompted Alice to act out and what she did with her life past the scope of the book’s text. There is a small section that gives attribution to sources of various quotes, and a note that both the text and illustrations were fact-checked, though only a name is given, not a title or affiliation. This informational storybook is organized like a fictional storybook, which will certainly engage young readers. Though it’s nonfiction, the book doesn’t seem boring or fact-laden; Alice is as bright and energetic as any fictional character. There is not a page without an illustration, and the text is formatted to look aesthetically pleasing as well, with different layouts, fonts, and font sizes. Since it reads in chronological order like a traditional storybook, there is no need for chapter headings or an index. This book is beautifully done. Edwin Fotheringham’s illustrations help the book read almost like a comic or graphic novel, yet are gorgeous enough to be framed. The text is straight-forward and almost basic compared to the illustrations, but the elements work together to give a more rounded story overall. For instance, after being warned by her father to avoid publicity, the next page simply reads “‘Oh, Alice.’” If only the text were being heard, this page would sound boring; when shown the illustrations, however, there is a two-page spread where Alice is being surrounded by newspapers with headlines all about her. There are also jokes in some of the illustrations that are missed when reading the text alone. I think this is a great approach because it seems sly and humorous, just like Alice herself. The style of this book is fun and lighthearted. This is clear from the front cover all the way to the author’s bio in the back. It’s clearly a project that both the author and illustrator were passionate about. The illustrations are playful and the text gives a broad overview of Alice Roosevelt’s life, encouraging further exploration by giving just enough information to pique the reader’s curiosity. The summary on the end pages complete the story of Alice’s life, but overall the book seems to be a great introduction to biographies in general and Alice Roosevelt in particular. I think it will encourage further reading. I wasn’t a big fan of informational books as a child; biographies seemed especially boring. I’m thrilled to see that the genre has had a complete overhaul. I can’t count how many times I’ve flipped through this book just to look at the pictures. The text is fun and interesting and easy to read, but the illustrations are what really grab me, and I feel they will grab younger readers as well. I will look for more Kerley biographies because I appreciate her approach to the genre. This is Edwin Fotheringham’s first picture book, but I am already seeking out his other illustrations from The New Yorker, Vanity Fair, The New York Times, and more. Maybe you knew there was a World Turtle Day, or even a Bulldogs Are Beautiful Day. But there is no way you knew about Yell “Fudge!” at the Cobras in North America Day! Thank goodness J. Patrick Lewis wrote poems about all the strangest, silliest holidays you’ve never heard of, and compiled them in World Ray Day. 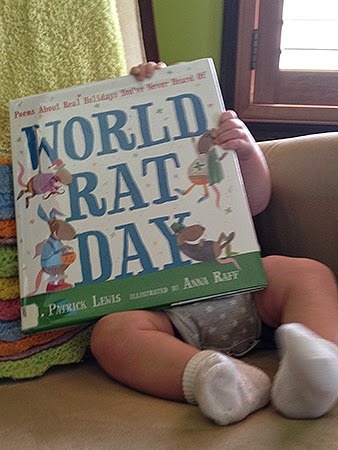 Arranged in chronological order, World Rat Day goes through the calendar year of odd holidays. Twenty-six humorous poems about the silliest of subjects - it’s got to be good! The poems range from four lines to having multiple stanzas. The date and holiday name is included with each poem, though the poems also have their own titles. The illustrations perfectly match the poems - not just as illustrations go nicely with a story, but the drawing style itself. Anna Raff uses watercolors and line drawings to bring Lewis’s poems to life. In most cases, the illustrations add another layer of story to the written poem. This makes the book excellent not only to read aloud, but also to take time inspecting the pages. The rhythms vary throughout this collection, but each poem has a distinct one. Many are extremely choppy, such as “A Flamingo” (23), which is a single sentence, and “The Rat Is” (10), which is two short metaphors. Both of these poems are very funny, so they seem to be short in order to simply deliver the joke. “A Thousand Baby Star” (12) and “Bats” (13), on the other hand, have longer lines and longer stanzas that give the poems a leisurely flow. Lewis uses a variety of rhyme schemes, including couplets, ABCB, ABB, and more. Some poems, such as “Eight Table Manners For Dragons” (2) are free verse; the jokes are puns within the lines themselves. These poems are funny, so the reader can do a lot with his or her voice while reading aloud to ensure children are captivated. Lewis uses a lot of alliteration, consonance, assonance, and onomatopoeia to give his poems personality. The language in this collection has clearly been carefully chosen to be approachable for children to read on their own, but also to sound interesting when read aloud. Words like “boomerang” and “airmailed” aren’t found much in children’s books, but they can be read easily, without a child stumbling over the word, and add a great sound to the lines they’re in. When a poet uses the phrase “electrified confetti” to describe fireworks (12), you know he’s got some great imagery in the rest of his poems! Even if the illustrations in this book were not spot-on, Lewis would help the reader imagine the subjects of every poem. Who else would describe a bulldog as “The sumo of canines / The semi of runts” (14)? The poems in this book aren’t especially emotional, as Lewis seems to focus more on humor. There are some unexpectedly beautiful lines, though, such as “murmurs to moonbeams / And whispers on wings” (13). 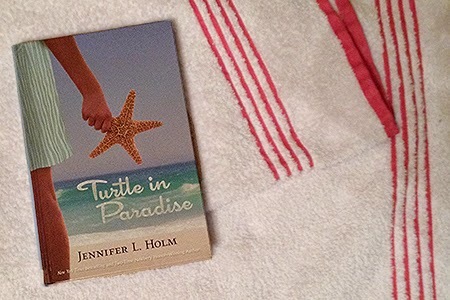 This book was really fun to read - both because of the humorous poetry, and the off-the-wall holidays! It’s also a great book if you just want to look at pictures! Stories can be told from the illustrations alone. Booklist reviewed the book, saying “Highly amusing anthropomorphized creatures rendered in ink lines and washes celebrate on white single- or double-page spreads.” Publishers Weekly calls it a “gleefully silly crowd-pleaser.” J. Patrick Lewis was the U.S Children’s Poet Laureate from 2011 to 2013, and has won the Excellence in Children’s Poetry Award. The possibilities are endless with this collection! - Have children pick their favorite illustration and really look at it. Have them tell or write a story about what’s happening in the picture that isn’t told in the poem. - Have children pick their favorite holiday from the book and write a poem as if they were celebrating. - Have children make up their own strange holiday and write a poem about it. - Since this collection is so humorous and random, invite the children to read other approachable poetry collections. It’s Raining Pigs & Noodles by Jack Prelutsky, illustrated by James Stevenson. This is a collection of 100 favorite poems by Mary Ann Hoberman. There is no specific subject - some poems make you laugh, some poems make you think, some poems let you experience things you might not otherwise be able to. This is a great collection to introduce children to poetry, because many poems are about childhood experiences that will be relatable and inviting for children. This is first and foremost a poetry collection, but the illustrations are a major part of the book. They add a lot to each poem. For example, the page spread featuring a poem called “Mouse” is accompanied by a drawing of a playful mouse chasing its tail around the poem, covering both pages (20-21). Some pages have an illustration as a background: “How Far,” “Growing,” and “A Year Later” are printed on the backdrop of a watercolor sunset over a lake (41). When multiple poems are featured on a page, Betty Fraser draws smaller illustrations for each poem. This layout makes the book much more interesting to children, and invites them to read the poem by showing them what it’s about before they even get to the words. For children who can’t yet read on their own, they can look at the pictures while the poem is read to them, and be more involved with the ideas than just listening alone. The cadence of these poems is perfect for children because it has a natural up and down flow, encouraging the reader to raise and lower their tone throughout each line. There are a variety of poems - some long, some short, some with long lines, some with choppier lines. This assortment is a great way to keep children interested because no two poems are alike. The poems in this collection rhyme, which is ideal for children. The rhymes create a natural rhythm, which makes reading poetry more fun. Rhymes also help grab their interest, and may even help in memorizing poetry, or just help them feel included by being able to chime in with the rhyming words! Many different rhyme schemes are employed throughout the book. Hoberman primarily writes in couplets and simple 4-line rhymes, but also plays with assonance, consonance, and alliteration in the lines. The words are playful and encourage the reader to squirm along, becoming more and more antsy with each additional adverb. Many of Hoberman’s animals poems are written this way, helping the reader picture how the animal looks, feels, and sounds. Not many metaphors and similes are used throughout the poems because the writing is very straight-forward and realistic. Hoberman chooses vivid words to accurately portray the experiences written about, such as birthdays, vacations, weather, and family relationships. The words are nicely chosen because they are not juvenile, even though the poems are aimed at children. The words are not over their heads, but they encourage the children to use context clues to derive meanings. Even if this collection was not illustrated, Hoberman’s language alone would bring the poems to life. Her word choice, when describing anything from a birthday bus to a termite, makes the reader not only visually imagine the subject, but also approach it with the other senses by conveying the scent, sound, and touch of objects written about. Since the collection is intended for children, Hoberman keeps the mood light. The poems don’t delve into deep emotions, but they are not all overly perky. They have a upbeat tone, but the happiness of the poems does not undercut the quality of the writing by making it seem too silly or lighthearted. This collection is fun to read aloud because the poems have great rhythm and rhyme. I loved some poems more than others, but with any collection there is some hit and miss involved. I agree with the assessment that this is a great introduction to poetry for children. From School Library Journal: “Hoberman's rhythms are lively and agile, and her imagination and sense of humor are still in tune with young readers. Fraser's simple but detailed gouache and watercolor illustrations exhibit the same qualities. The layout is masterfully varied and never overwhelms the poems.” Mary Ann Hoberman’s work has previously won the American Book Award. In 2003, she received the Award for Excellence in Poetry for Children, and received the Children’s Poet Laureate award in 2008. Ask children which poem was their favorite, then have them write a poem of their own in similar style. If they’re having trouble, suggest they work backwards! First, think of rhyming words and jot them down. Then they can make sentences with the rhyming words at the end, and put them in poem format to tell a story or describe something! 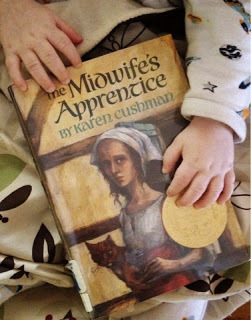 Not only is my son a little too young for this book, but I read it too quickly to share with him! Mary is an educated girl living in a time when women are typically just wives and mothers. Her intellect captures the attention of her father’s friend, poet Percy Shelley, and they run away together. Unfortunately, Shelley is still married to another. This begins a lifetime of drama and turmoil for Mary, who loves Shelley unconditionally and lives for him, learning, and writing. 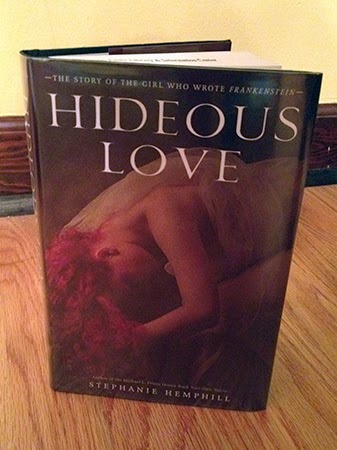 Written as a verse novel, Hideous Love is a powerful story about the life of Mary Shelley, author of Frankenstein, told from her point of view. The poetic style comes across as genuine and works because Shelley is a writer herself, and an intelligent woman with strong emotions. Nothing comes to me” (126). The short lines inspire the reader to ruminate on what is being said, instead of rushing on to the next line. “I busy myself” and “I want to speak” stand out as the actions, implying that Mary is trying hard to come up with a story but can’t, though she wants to get the words out. “Mysterious fears,” “awaken,” and “thrilling horror” stand out in the next two lines, adding urgency and emotion to the stanza. The last line is a let down, deflating after the build-up immediately before. There is no rhyme scheme in the poems of this book; it is written in free verse. The individual poems have no particular sound as far as alliteration, consonance, repeated words, and so on. However, there is the tone (maybe just in my imagination) of a somewhat quiet yet educated voice reading these poems in a level voice. The language in this book is perfectly chosen. Each word sounds like one Mary Shelley herself would pick for her writing, so it really helps the reader become immersed in her life story. Most ideas, emotions, and experiences are explained in straight-forward terms without simile or metaphor, but that does not diminish the quality of the story at all. In fact, I think it helps to make the book seem like it is actually from the 1800s. Sensory words are used to establish the environment of Mary’s childhood home and her overbearing stepmother. It effectively conveys the destitute journeys Mary and Shelley took in the early years of their relationship. 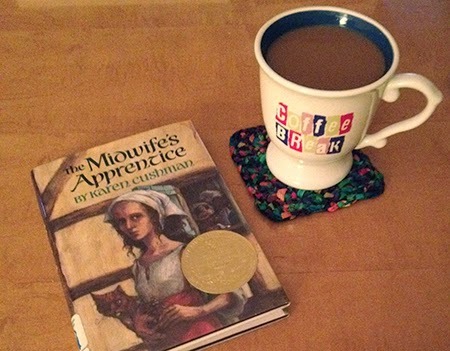 And it vividly draws the reader in to Mary’s grief… but I’m getting ahead of myself. a destination I will reach” (38). Simple language and a simple idea, but beautifully expressed to sweep the reader away with the words. I had previously only read one verse novel, years ago, and was not a fan. I’m so glad I read Hideous Love, because I’m now inspired to read more verse novels! It was very well done, and incredibly interesting. I found myself researching Mary Shelley as soon as I finished the last page. I had never known much about her, never even read Frankenstein, but this book was so engrossing that I immediately checked out her most famous novel and am eager to read more - not only by Mary Shelley, but also by Stephanie Hemphill! From The Horn Book: “In first-person, present-tense verse, author Stephanie Hemphill creates an informative, impressionistic introduction to Mary Shelley’s life.” Booklist says “This is, as intended, an ideal companion piece for teens studying the original classic,” and I have to agree. Hemphill’s previous work has won a Printz Honor and the Myra Cohn Livingston Award for Excellence in Poetry. Instead of having students write traditional reports on notable figures, let them be inspired by Hideous Love. After researching their intended subject, have them write their report in verses, as if from the person’s point of view. This will make them think differently about the assignment - instead of simply regurgitating and repeating important facts, they’ll put themselves in someone else’s shoes, try to see the world through their eyes, and give them a more interesting approach to learning about history. They might even be inspired to go above and beyond the required research to find out as much as they can about their subject’s time, in order to better write from that point of view. Besides LS5603 Literature for Children and Young Adults, this semester at TWU I am also taking LS5043 Information and Communication Technology. The class has been really interesting - I'm learning about copyright law, how libraries can take advantage of social media, and all about a variety of Web 2.0 tools. In fact, this is the first time I've heard the term Web 2.0 tools. Whether you're a librarian or civilian, a digital native or one trying to resist - have you heard the term before? Each of my classmates evaluated a different Web 2.0 tool, and I'm eager to explore them all. For now, I'd like to share the Popplet I made. It's just a start - a way to list what books would be best for storytimes in October. This tool has so much potential, and I'm really glad we had this project for class. There are so many ways to share and collaborate with Popplet! Anansi the spider is always getting into mischief. This time, he’s too lazy to do any work. While his neighbors clean their houses and take care of their gardens, Anansi sleeps. After the neighbors badmouth Anansi, he leaves to find a more peaceful place to sleep think! He sees the Hyena is also sleeping, but his house and garden look wonderful. Anansi hides to find out Hyena’s secret. Soon enough, Hyena wakes up and says the magic words: “Hocus-pocus, Magic Stick. Sweep this dust up. 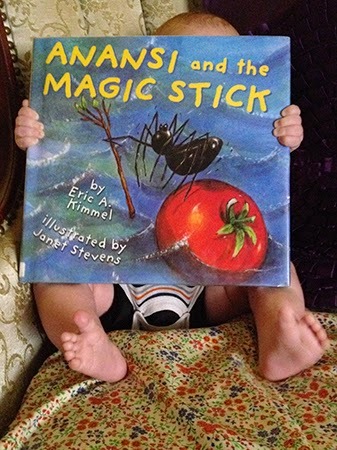 Quick, quick, quick!” The stick does as it’s told, and as soon as Hyena goes inside, Anansi runs home with the stick. He has it clean up his house and garden, but falls asleep as the stick is watering. Anansi told the stick “Don’t stop!” and never woke up to speak the magic words, so the garden becomes flooded. The water becomes a stream, then a river, and all of the neighborhood is floating away. By the time Anansi wakes up, the flood is out of control, and he can’t remember the magic words! Will he be able to stop the water? More importantly, will Anansi ever learn his lesson? Every page of this book is beautifully illustrated, including the end papers and the author’s pictures! The drawings seem somewhat traditional: the animals are anthropomorphized, but they are portrayed realistically, instead of as cartoon characters. Even though they look realistic, the animals are vividly colored and have a lot of personality shining through. “Steven’s comic creatures with their surprised expressions add kid appeal,” says Publishers Weekly. The repetition of the Magic Stick’s rhyme, and the gibberish quality of the spell to make it stop, makes this a fun story to read aloud. This playfulness with the fonts, along with the bright illustrations, is a nice spin on a traditional tale, updating it for younger children to enjoy it now, while still learning lessons along with, er… thanks to Anansi. I remember loving traditional tales as a child because I always thought the lesson learned was fun (I know, I know - I’m a nerd!). When I had to read it this time, however, I found I was almost dreading it, just because it seemed, well, a little boring. 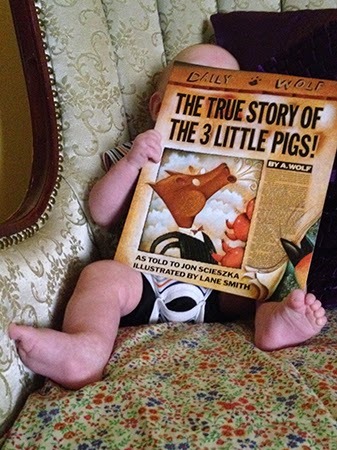 The cover seemed kind of plain, and I had just read a silly book, The True Story of the 3 Little Pigs. I was relieved to open the book and find such colorful illustrations, and it seemed more appealing since the drawings covered the majority of every page. I think illustrations are important for traditional tales, because the tales are so wonderful to read aloud and be heard - that means having interesting stuff to look at will pull the children in to the story even more. I also think the silliness of the spells to start and stop the Magic Stick are fun to read aloud, especially when the reader is expressive and stumbles over the forgotten spell with Anansi towards the end. The reader can also speak the animals’ lines in what their voices would sound like, with Hyena’s laugh and Lion’s roar. ”This tale has a more traditional ring to it than Kimmel and Stevens’s Anansi and the Talking Melon, but whimsical illustrations add a modern-day appearance. The art has a softer focus than in Talking Melon but the same bright colors fill the pages, and the whole adds up to an enjoyable offering that is clever, funny, surprising, and traditional all at once.” from School Library Journal.